Oklahoma City Municipal Courts Complex is a new three story, 70,000 square foot, facility for the City of Oklahoma City. It will serve the Oklahoma City residents with 6 courtrooms. The complex will host office and meeting space for the Courts Administration, Marshalls, Prosecution and numerous other City services associated with the Municipal Courts. The complex combines traditional design with modern features. The grand staircase and 3 story atrium greet you when entering the building. The space is conditioned with a highly efficient chilled beam HVAC system that is fed from the Central Plant in downtown OKC. The electrical systems and robust backup generator provides redundancy, uninterrupted business and peace of mind. The latest use of technology and communications for security, court scheduling and ease of doing business is incorporated into the complex. All courtrooms are accented and finished with custom wood millwork, natural stone and acoustical panels. 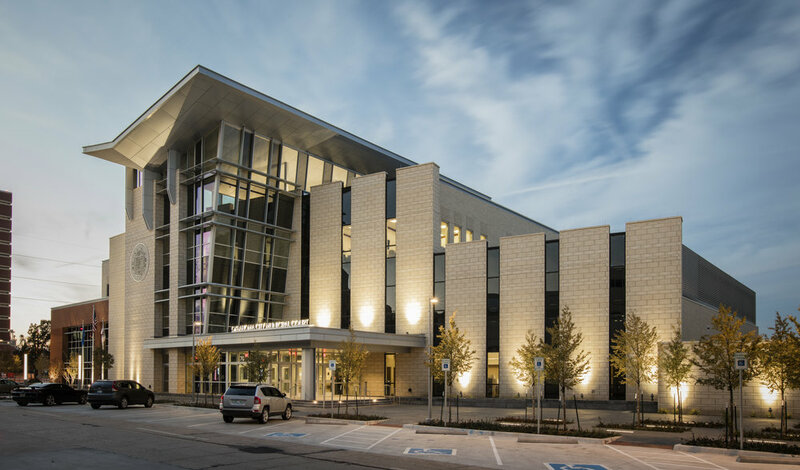 An exterior aluminum and glass storefront combined with CSMU, brick, composite metal and aluminum cornice complete the exterior for a clean look. CMSWillowbrook is honored to be a part of constructing this grand facility that will serve the Oklahoma City Community for many years to come.